I feel like I have been posting a lot of soup recipes, as well as eating a lot of soup ( my go to lunch has been the vegan pho from Phoenix Garden, delicious). 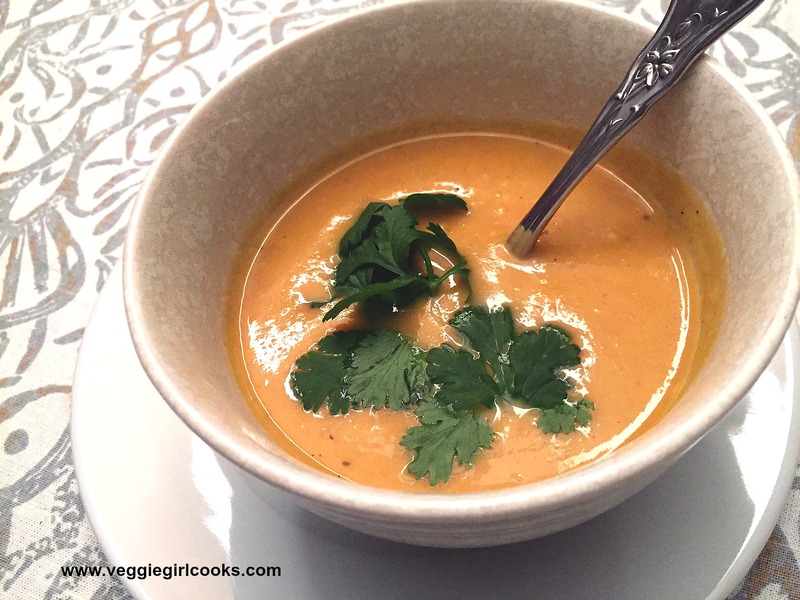 Normally I am not a fan of squash soups, all of the recipes seems to have cinnamon or nutmeg in them, and that is a combo that I do not care for in savory dishes (do not get me started on pumpkin pie spice). Recently I have come across a few recipes that have warm spices like coriander and cumin, which is a combination I do like. So, after a little reading and I decided to try roasting all of the veggies and using the crock pot; the result was delicious. Peel and and chop the butternut squash for roasting, as well as the carrot and quarter the onions. Toss vegetables with coconut oil and 1/2 the spices, salt and pepper. Place the veggies in a single layer on a parchment or foil lined baking sheet/s (is you are using parchment you can cut back or eliminate the oil). Nestle the garlic clove in the middle of the vegetables. Roast at 375 for 40-50 minutes until they are fork tender. Add vegetables, stock, remainder of the spices and squeeze out the roasted garlic from the bulb and ginger add to your slow cooker (you can also cook in a large pot stove top, simmering for about an hour). Set to low for 6-8 hours, or high for 3-4. I sued my immersion blender, or you can blend in batches in your blender. Add coconut milk and let it heat through, about 15-20 minutes. About every 2 weeks, I go thoroughly go through the refrigerator and pantry to clean out, organize and throw out. 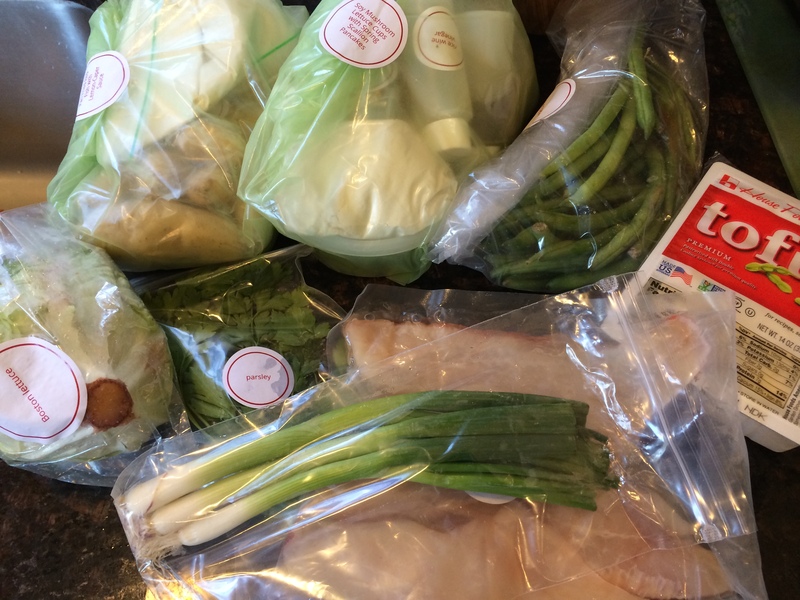 I tend to find veggies that need to be used, open boxes of veggie broth, half boxes of pasta, etc. On a recent cleaning frenzy I found potatoes, radishes, carrots that needed to be used and I had purchased a few lovely golden beets that I had already used the greens. I have been reading “The Cookbook” by Yotam Ottolenghi and I was inspired to use za’atar seasoning and fresh lemon, and there you have it – roasted veggies with za’atar and lemon basil . Quick, easy and delicious. Wash and chop vegetables, I did peel the beets, but you can scrub them well and you will not have to. In a large bowl combine veg with za’atar, coconut oil (melted) salt and pepper to taste. Place on a baking sheet in a single layer and roast for 30-40 minutes (until fork tender). In a separate bowl combine lemon juice and zest, salt and pepper, garlic, chopped basil and mustard. Stream in oil to make a vinaigrette. Serve veggies warm with vinaigrette spooned over. 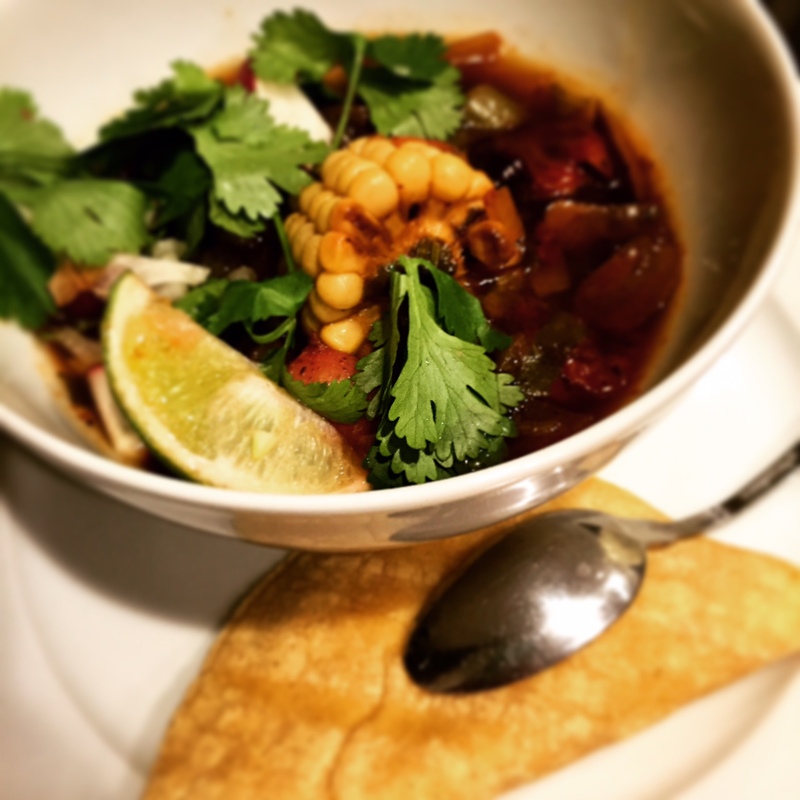 To keep with my commitment of eating more vegan recipes, and leftovers, I attempted Vegan Posole this weekend. 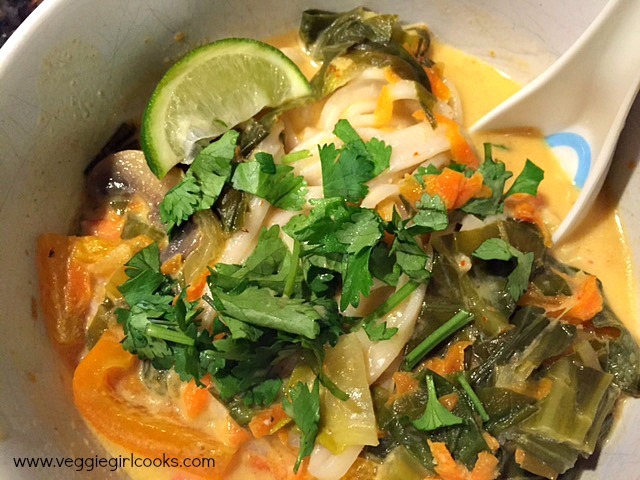 Part of the inspiration came from the Engine 2 book Diet book recipe for Mexican Lime Soup. I considered just cooking on the stove top, but Sunday in Richmond was 60+ degrees, and I figured it was the last warm day for a while, and I wanted to enjoy it. So into the slow cooker it went. Delicious hearty soup, with leftovers. I roasted the peppers in the oven at 400 for about 20 minutes, I diced and added the cubanelle and jalepno to the crock pot with the other ingredients, stock, tomatoes and roasted corn. Remove the stems and seeds form the dried and roasted chiles dried chiles, crush and added to about 1 cup of hot water and let steep for about 30 minutes. Blend (or use an immersion blender) to get a paste, push through a fine mesh sieve and add to the slow cooker. Let it cook on high for 3-4 hours or low for 6-8. Garnish with cilantro, radish and avocado and serve with chips or a regular corn tortilla. I will try not to make this a post about resolutions, eating better, working out more and things like that; BUT, I have committed to adding more vegan meals to my diet, eating leftovers (I usually avoid leftovers, I know, silly), and generally trying to improve my overall health ( I had a rough few months at the end of 2014). So, to start off 2015, I took a long overdue spin class at Boho Cycle Studio, one of my favorite placed to work out (if you haven’t been your first class if free! ), signed up for a barre class at Pure Barre, as well as buying a package of classes for Pound from CO2 Fit ” POUND™ is a great effective program that can appeal to people at every fitness level. Similar to the popular Zumba classes, in POUND™ you can get fit while feeling like you are at a party. But you don’t even have to be a good dancer, you just need to POUND the Ripstix™ while rocking out to great music.” Also, I am really looking forward to new fitness classes as well as the Monument Avenue 10K with the awesome folks from Strangeways Brewing. For New Year, in the Southern Tradition, I made Collards and Hopping John with cornbread; it is supposed to bring money and prosperity for the new year, plus it is darn tasty. I did make mine vegan, of course more traditionally you would use pork or ham hocks. I hope your New Years celebrations were wonderful and luck and prosperity comes to you in 2015. You can soak your black eyed peas overnight (discard that water when done) or simmer on medium until fork tender (about 60-90 minutes) stove top ( drain and discard cooking liquid). Saute veggies, garlic and spices. Add soaked black eyed peas and veggie broth and tomatoes simmer for about 2 hrs or until the black eyed peas are tender. If needed throughout cooking you can add a little water. Season as needed with salt and pepper. Enjoy! Wash the collards in a large sink full of water, letting any grit fall tot he bottom of the sink. Saute the onion, garlic, pepper until translucent. Add washed greens to the pot, do not worry about drying them off, the liquid will help form the “pot licker”. Saute until the greens are tender (45 or so minutes). about 1/2 way through I add the vinegar, you may want more at the end. 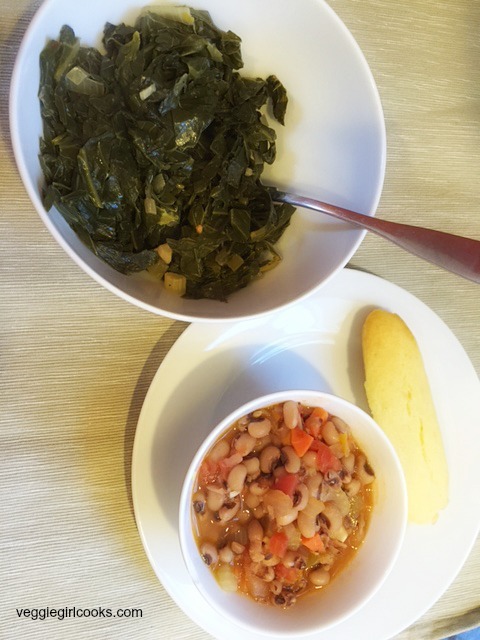 Serve hot with your Hoppin John and cornbread and ENJOY! Hey there ladies and gents! It has definitely been a while since I have posted, and I could give a million reasons, but honestly, life got in the way. A few weeks ago I was at Foo Dog with a few of my friends for lunch and had their Malaysian Style Ramen with tofu, and it was delicious. I had been thinking about it and wondering if I could recreate it at home, and I think I came close. My inspiration recipe came from Cooking and Beer for Coconut Curry Ramen Noodle Soup. I made the dish vegan but you could of course add a protein of your choice. Heat heat 6 ounces of the coconut milk, coconut butter and curry paste and stir to combine. Cook for 2-3 minutes, add the jalapeno, garlic, bell peppers, mushrooms and cook for 3-5 minutes. Add the rest of the coconut milk, veggie broth, salt and pepper, soy and “fish” sauce and lemon grass. Bring to a simmer and add the book toy and let simmer for about 20-25 minutes. Lower the heat to a simmer and add the carrots, lemongrass, fish sauce, soy sauce, lime juice, brown sugar, ginger, bok choy, and the red and orange bell peppers. Cook for 15-20 minutes. Remove the lemongrass stalks and discard. I prefer to cook the noodles separately and add to each bowl, you can also cook them in the broth. Check the soup for seasoning, add salt, pepper, soy to taste. At this point you can lightly dust the cubed tofu with cornstarch and pan fry (in a separate pan), or just leave it cubed to add at the end. I added noodles to the bowl, tofu, broth and garnished with cilantro, lime, jalapeno, and a little basil. 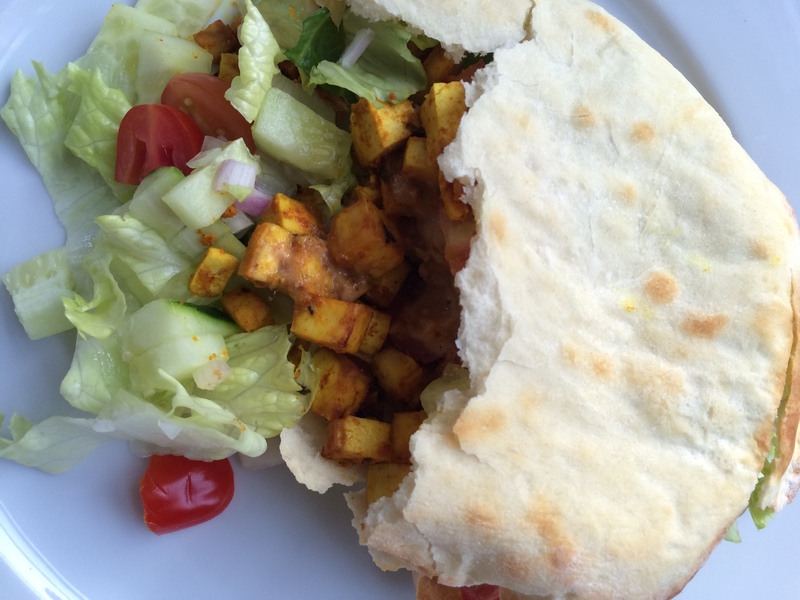 So last week when I decided on Tofu Shawarma, I also knew I had to have Pita with it. 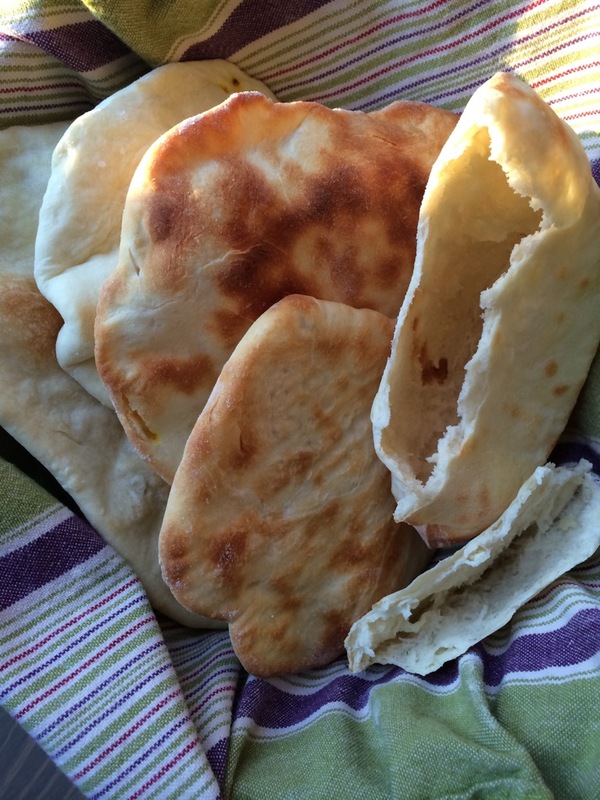 Now of course I could run to the store and pick some up, but I googled how to make it and voilà, I found “How to make Easy Pita Bread” from the kitchn. The only real change I made was 1/2 whole wheat and 1/2 plain AP. I have to say, it was very quick and easy, and turned out great! Stir together, adjust for heat to your liking. 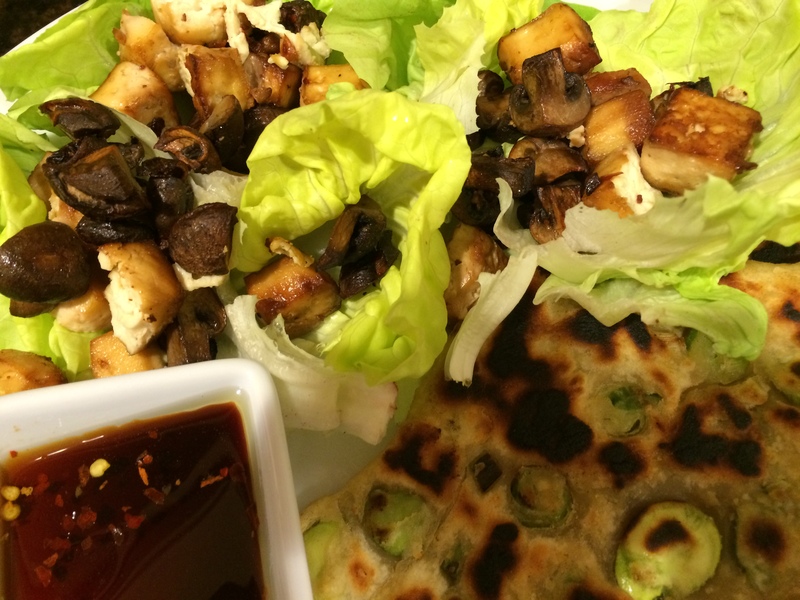 Serve tofu with chopped lettuce, diced cucumber, tomato (I added a little red onion) as a salad or in a pita. Pita recipe to follow this week. It is strange that I make dessert all of the time, but I don’t necessarily eat it. With a lot of friends and family with dietary restrictions, I am always looking for new ways to make a recipe. I started reading up on dairy substitutes and egg substitutes. I came across an article with ideas for different ways to replace dairy, even sweetened condensed milk. Off to the grocery store to find “Cream of Coconut” which is different form coconut milk, just like condensed milk, most of the water has been removed. Supposedly a 1:1 substitution… well it was. 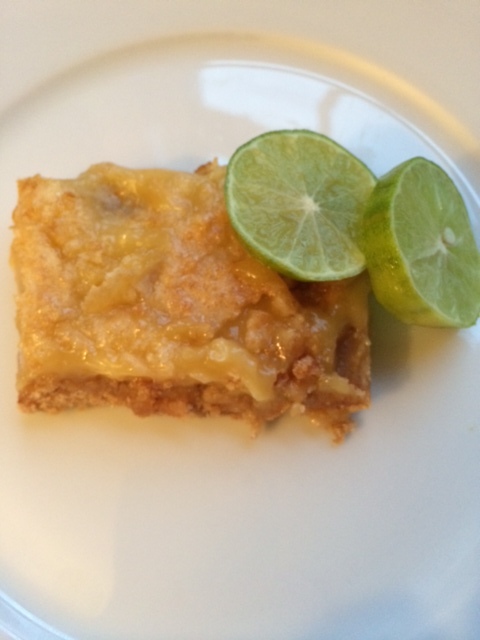 There was no real coconut flavor, I think the fresh Key Lime juice may have overpowered it. As you can see I also used coconut oil instead of butter in the crust. I considered an egg substitute to make it completely vegan, but I 1 substitution seemed enough. For the crust: Preheat oven to 350 degrees. Combine graham cracker crumbs, sugar, and coconut oil in a small bowl. Press into an 8-inch square glass baking dish, tying to get it even. Bake until dry and golden brown, about 10 minutes. Let cool completely on a wire rack. For the filling: Put egg yolks and lime zest in the bowl of your mixer fitted with the whisk attachment. Mix on high speed until very thick, 4-5 minutes. Reduce speed, add cream of coconut (you will need to stir this first, it separates) in a stream, mixing constantly. Mix on high; mix until thick, about 3 minutes. Reduce speed and add lime juice, mix until combined. Pour filling into cooled crust. Bake, about 40 minutes rotating dish halfway through. Let cool completely on a wire rack. Refrigerate at least 4 hours (or overnight). You need to let the bars come up to temperature or dip the bottom of the pan in hot water to help loosen the crust from he pan before cutting. 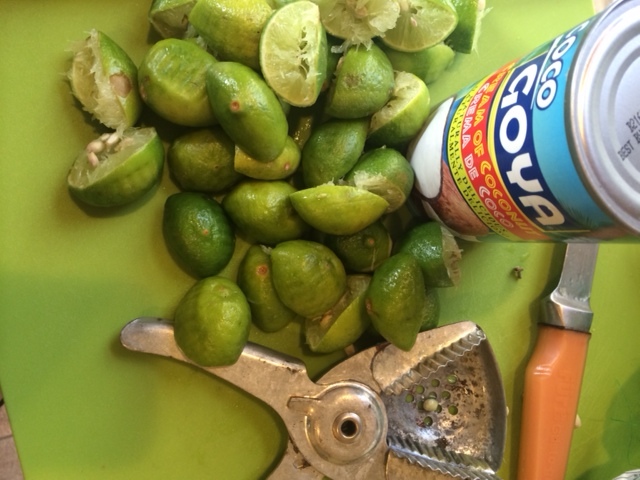 Garnish with lime slices, and zest if you have any left. We were invited to a Memorial Day cookout late in the morning on Memorial Day. With lots of little errands to run before the cookout, I didn’t want to get into a complicated recipe or spend a lot in the kitchen. I figured a crumble or crisp was pretty easy. I had settled on a rhubarb and strawberry, but the grocery store was out of rhubarb, so I switched gears to strawberry and blueberry. I also decided because I had found an extra bottle of maple syrup and I had gluten free flours, I would skip all of the extra sugar and make it a “little” healthier. 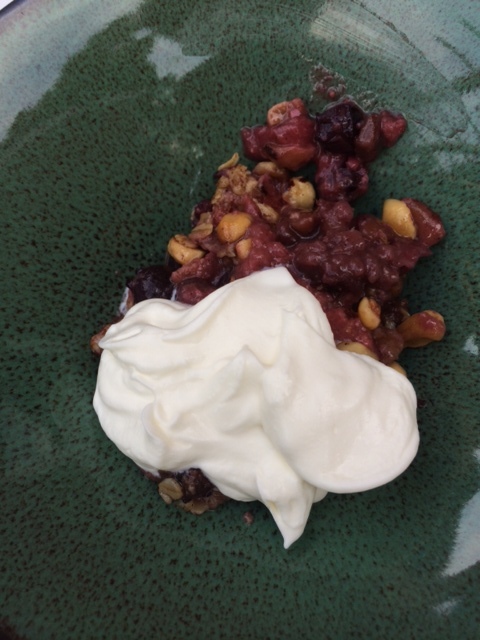 In a medium bowl, toss the berries with flour, spices, orange juice and maple syrup. Set aside while you assemble the topping. In a separate bowl, combine oats, flour, salt, zest and spices. In a small bowl whisk together the oil, maple syrup, vanilla extract and water. Add the wet ingredients to the dry ingredients and mix thoroughly. Fill an 8×8 pan or small casserole dish with the berries and top with the oat and nut mixture. bake covered for 30 minutes, remove foil and continue baking for 10 or so minutes until the top is golden. Serve room with ice cream or whip cream and enjoy. I have not posted in a while, mainly because things have been busy and I haven’t made anything “blog worthy”. Recently I caved in and tried Plated, not something I would usually do, but the “only pay for shipping” was too good of a deal to pass up. I ordered 2 meals, Mushroom Lettuce Cups and Pan Fried Redfish . It came neatly packaged (Saturday delivery) with step by step instructions. 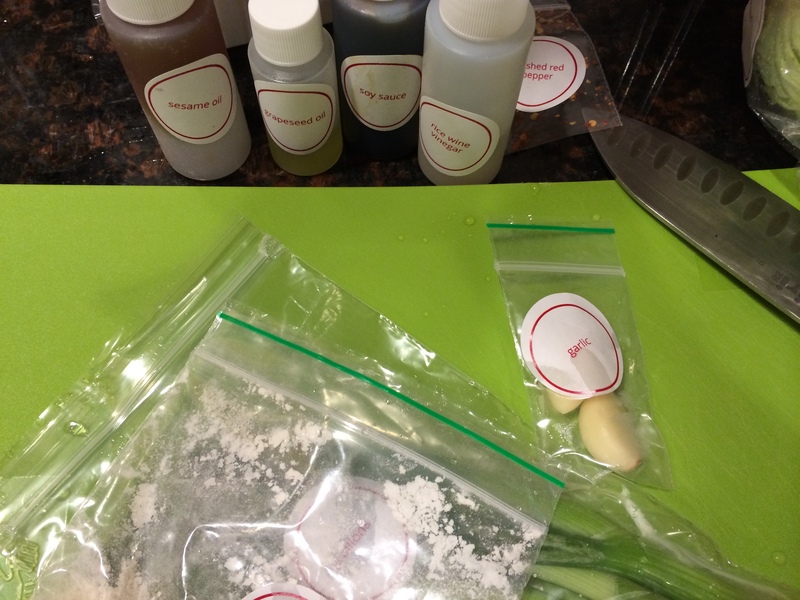 All of the ingredients were packaged and measured out, just needing salt, pepper and oil. 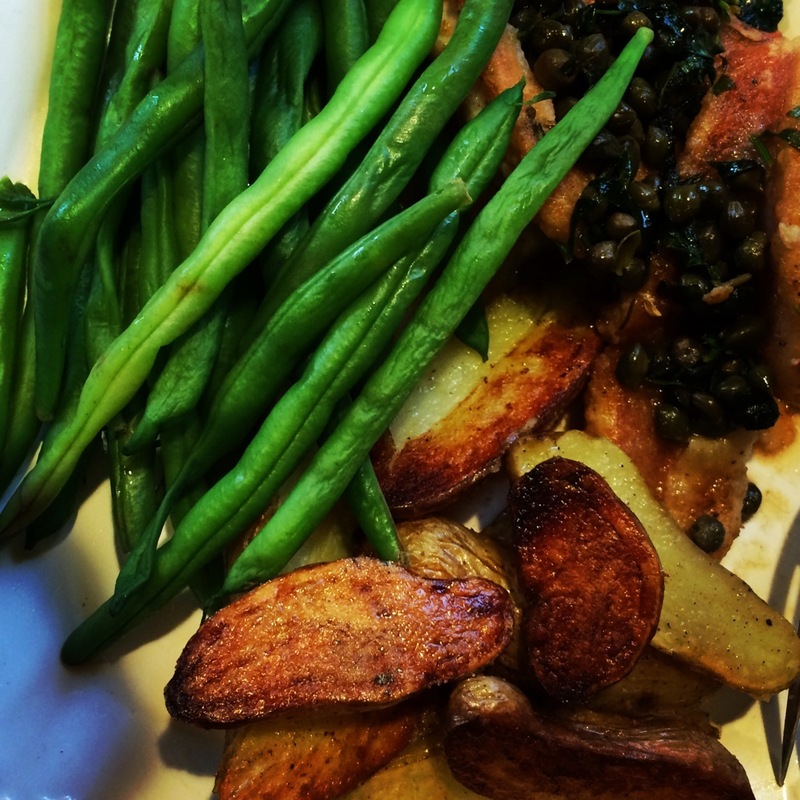 Sunday night I decided to cook the red fish with green beans and potatoes. Simple instructions that included a white wine caper sauce. 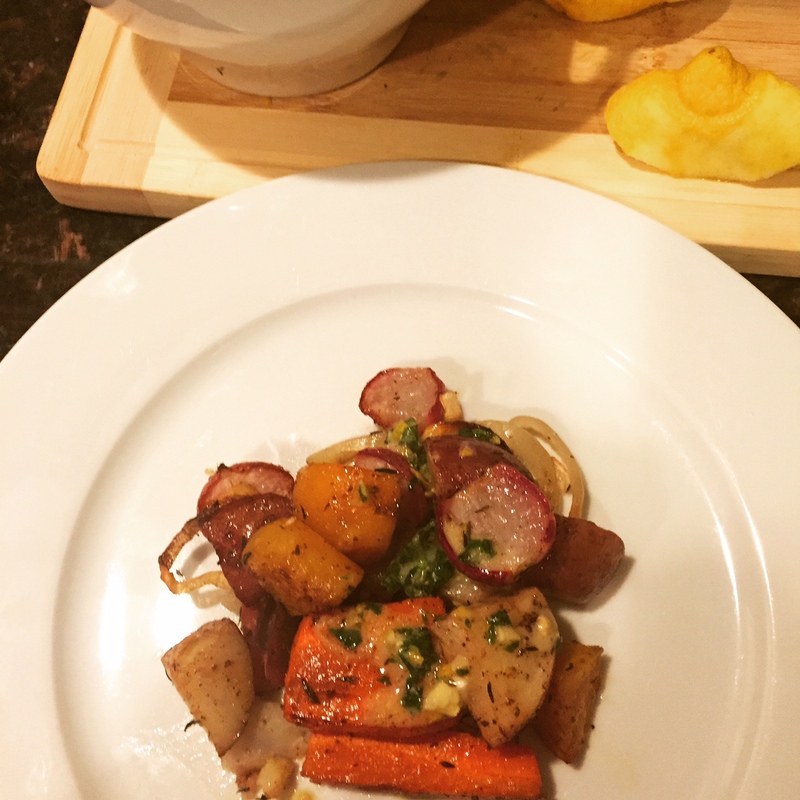 It was very good, not to complicated (even if you don’t consider yourself a great “cook). Last night, I made the Mushroom Lettuce Cups. This recipes was marked a little more difficult, which I agree if you are not someone who cooks often, but I felt it was really time consuming and the fava beans made the pancake dough wet and sticky. I ended up using extra flour to compensate. I also felt the tofu needed to be pressed (I am used to Twin Oaks, which does not require pressing and is MUCH firmer). This meal was not as big of a hit as the first meal. 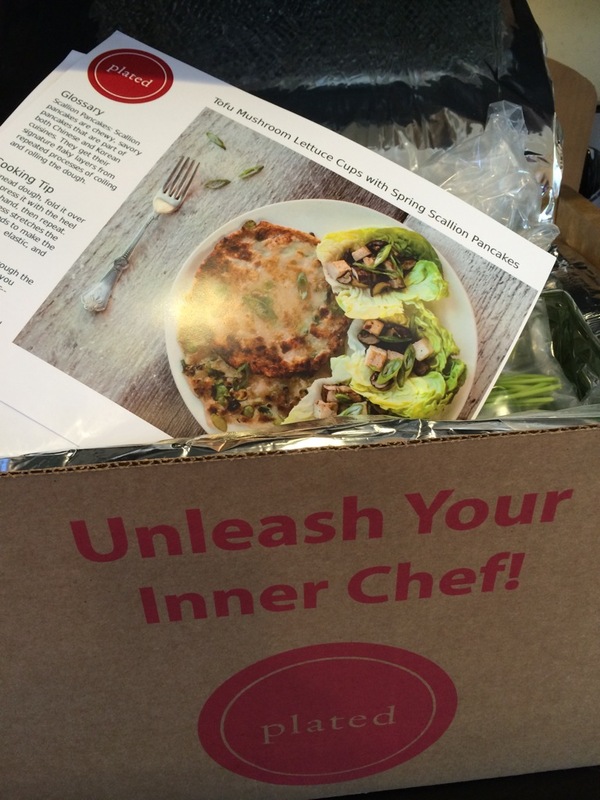 Plated is a great idea, it gets you in the kitchen and has great selection of recipes. I am not sure I would use it weekly, but I really like the idea. If you are interested in trying it out there are always promo’s on Facebook or you can use my link to receive a special, https://www.plated.com/invites/fc5648.